Storage: Keep in the fridge, in a plastic bag (such as the one it comes in). 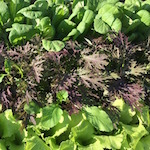 To Prepare: We double rinse all of the salad after we harvest it, but it's always a good idea to rinse it again when you bring it home. Simply dunk it in cold water, then drain it. Salad spinners make this very easy.